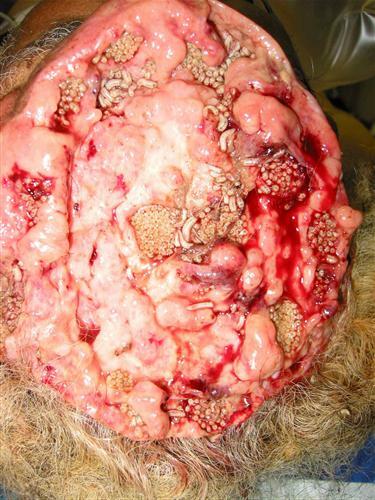 Photographs of a man in his 70s who was suffering from an unusual form of cancer which had eaten away at the upper portion of his skull and scalp but who had not sought any medical treatment because the condition was not causing him pain. The man was brought to the trauma center at Stanford University Hospital (where the photographs shown here were taken) by San Mateo County paramedics who had been summoned to the scene after the man was involved in a minor automobile accident and who found him in his car in the condition pictured. Maggots can infest the human brain, and so can certain types of tapeworm larvae (pork tapeworm).